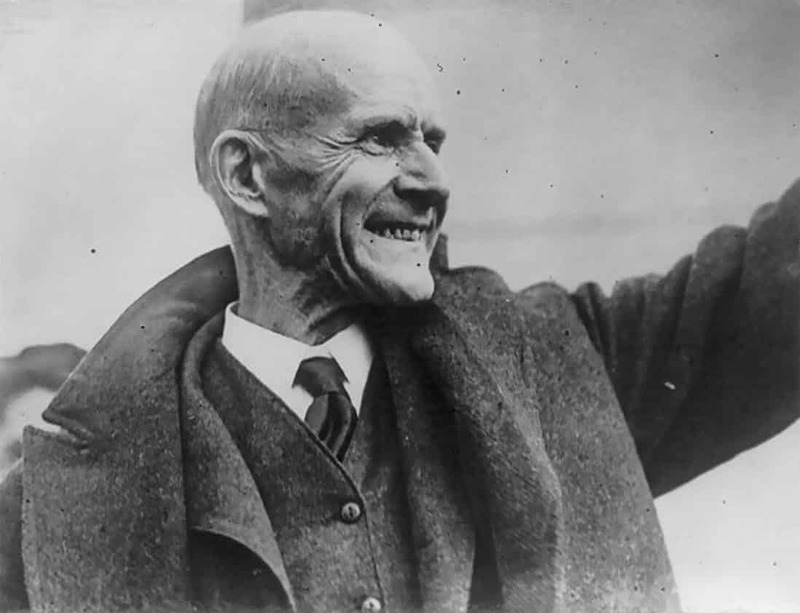 Eugene V. Debs, 5 times Socialist candidate for President, set free from prison on Christmas Day. 1921. Courtesy: Library of Congress. Leo Huberman was a founding editor of Monthly Review, 1949–1968. “The Debs Way” is the text of an address Huberman delivered at the Debs Centennial Meeting held at the Fraternal Clubhouse in New York City on November 28, 1955. It was first published in Monthly Review 7, no. 9 (January 1956). In 1912, as the Socialist Party’s candidate for President of the United States, Debs received over 897,000 votes. This was 6 percent of the total popular vote for the Presidency, or the equivalent of roughly 3 million votes in the 1948 election. There were, in 1912, many Socialists in state legislatures, and thirty-three cities and towns had Socialist heads of government. The popular interest in socialism was reflected in the enormous sale of socialist literature; pamphlets by socialists were printed in editions of hundreds of thousands; books by socialist authors often ranked with the best sellers of the day. The Appeal to Reason, the most important national socialist newspaper of the period, had a subscription list of over 300,000 and on special occasions it reached a circulation of over 600,000. While it is true that much of the radical strength of that period came from immigrants, particularly from the needle trade workers in the East, it is a mistake to assume, as many people so often do, that this was the most important part of the Left movement. It was not. Socialist Party strength was widely distributed—in the Middle West and Far West, as well as in the East. Some time ago, I read through several years of the Appeal to Reason. In the issue of August 15, 1908, I found a breakdown of the subscription list of 300,000, by states. Oklahoma led the list with 24,402, California was second with 20,852, and New York was fifteenth with only 8,580 subscribers. Of the states ahead of New York, nine were west of the Mississippi. The year 1912 represented the peak of radical voting strength; since that time it has declined. Today, one hundred years after the birth of Debs, the Left movement in the United States is at its lowest ebb—not only in respect to vote-getting but in every other respect—strength of organization, numbers, influence, interest, literature. In regard to the radical press, this is easily demonstrated: take the circulation of the four journals represented on this platform [I. F. Stone’s Weekly, Monthly Review, American Socialist, and National Guardian], add to it the circulation of the entire Socialist Party and Communist Party press, The Call, The Daily Worker, Peoples World, Political Affairs, Masses & Mainstream, throw in the weeklies of the DeLeonites and the Trotskyites, and include, too, the circulation of even the liberal journals, The Nation, The New Republic, and The Progressive. Add them all up together and the total figure won’t reach 200,000—not even two-thirds of the circulation of the old Appeal to Reason. The decline in influence of the Left press is a measure of the decline of the strength of the Left—its isolation from the main currents of American life, its lack of influence, its loss of membership. And this deeply disturbing situation in the United States occurs at precisely the moment in history when a large proportion of the rest of the world is moving toward socialism at a rapid rate. Why? Why has socialism become a dirty word in our country at the very time that in other countries it is a beacon of hope? This is an important question. Some of the answers are known to us now, others still require further research and study. Of greater importance is the question: What shall we do now, how shall we remedy the situation in which we find ourselves? Coming from any other American, then or now, this statement would sound maudlin; coming from Debs, it was convincing—because it was true. Who in public life today can match the legacy which Debs left to all Americans? The unswerving conviction that capitalism, this system of profit making and greed, is irrational, unjust, and evil; that men were meant to be brothers, and that the only system worthy of humanity is one based on cooperation, not exploitation. That the profit-making system is on the way out. That there is a class struggle; and it is the task and honor of the working class to be capitalism’s grave digger. That socialism is an honest and human enterprise; its ends cannot be obtained by stealth, intrigue, cunning, or double-dealing, but by militant struggle, class-conscious education, outspoken resolve, self-abnegation, and finally, the loyal cooperation of the mass of the people. These principles, I suggest, are part of Debs’ heritage to the American Left. At least one of the reasons for the present plight of the American Left, to my mind, is the fact that it has tended to squander this heritage, to ignore or forget these principles. How else can one explain the fruitless debate between those who would dabble in the internal politics of the capitalist parties, and those who would use up our time and energy in the creation of an independent—not plainly socialist—party which hasn’t the slightest chance of success? Or the totally unrealistic approach of those who continually call workers to non-existent barricades in the mistaken belief that simply because they are workers, it naturally follows that they hate the boss and the profit-making system? Or the narrow sectarian approach of those who insist that because “socialism is the only answer,” we should therefore not concern ourselves with anything that smacks of reform? Or the equally wanting—albeit more persuasive and more popular—approach of those who confine the struggle merely to reforms, with never a word about the socialist goal? None of these, I suggest, was Debs’ way. Once he understood the nature of the evil and its cure (in his own words, “it was like passing from midnight darkness to the noontide light of day”), once he discovered that capitalism must be replaced by socialism, he never stopped saying so. He coupled the day-to-day struggle with socialism. He didn’t feel, as do many believers in socialism today, that the fight for immediate issues would, of itself, bring socialist consciousness. No. He knew, and acted upon the knowledge, that the trade-union struggle and the political struggle must be wedded to socialism to bring class consciousness and socialist consciousness to the workers. This revolutionary watchword was, indeed, inscribed on the banner of the IWW—of which Debs was one of the founders. Who does not know that we Social-Democrats are not opposed to fighting for reforms, but that, unlike the social patriots, unlike the opportunists and reformists, we do not confine ourselves to the struggle for reforms…? We are not opposed to elections and reforms for the purpose of reducing high prices, but we attach primary importance to telling the masses the truth, namely that it is impossible to combat high prices excepting by appropriating the banks and the big factories, i.e., by social revolution. That was Debs’ way. He had enough faith in the working class to tell them the truth—all of it. He called a spade a spade in talking about our present social and economic system. It is rotten through and through. It cannot be patched up. It must be replaced by a decent social order. This Debs believed—and this he said. And we who believe these things must be just as outspoken. We must say these things now, because they are still true. I realize, of course, that there have been many changes for the better since Debs’ day—and that the task of converting people to socialism is, therefore, much more difficult. The minimum program for which Debs and the socialists fought in the 1900s and after, has now become a reality. We have won the eight-hour day, old-age pensions, minimum wages, abolition of child labor, direct income tax, unemployment insurance, workmen’s compensation. But that does not mean that the basic problems to which Debs and his socialist followers addressed themselves have been solved. Not at all. The basic problems still exist. In spite of the present big boom, the unprecedented prosperity, the gadget heaven so many people have entered on the wings of the biggest consumer debt in our history, we have not yet conquered poverty. Not according to the latest government figures contained in the October 1955, report of the Joint Congressional Committee on the Economic Report. That document tells us that in 1954, of the 41,934,000 families in the United States: 20 of those families, or one out of every five, had incomes of less than $2,000 a year. Forty dollars per week for a family, in the year 1954. 32 percent of those families, or roughly one out of every three, had incomes of less than $60 per week. Our trade-union movement is today bigger than ever before in history. Yet only one fourth of the total working force is unionized, and millions of unorganized workers still work for substandard wages in substandard conditions. In Debs’ day the growth of trusts was a point of agitation for socialists. But the biggest of the big of his day would be as pigmies compared to the corporate giants of today when some 250 corporations own almost two-thirds of the entire country’s manufacturing facilities. The employees, with their families, of just four of the leading industrial concerns outnumber the population of eleven of the forty-eight states. Nor can it be denied that, in spite of the widespread prevalence of cars, refrigerators, television, and so on, gross inequalities still exist in wealth, income, and opportunities. As a matter of fact, the poorest 30 percent of the people get a smaller percentage of the total national income today than they did in 1910. 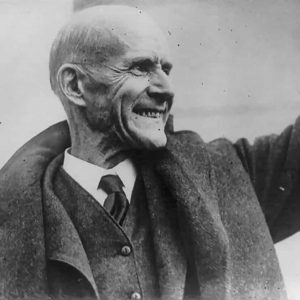 The inherent drive of the capitalist system toward war as the solution to the ever-present problem of overproduction is certainly as marked today, if not more so, than it was in Debs’ day. The basic problems, then, still remain today—in spite of the undoubted gains that have been made in some fields. But the task of reaching people is admittedly more difficult, both because of the manufactured hysteria and attendant repression, and because the noise of the motor in the car bought on the installment plan, and the soothing tones of the television’s propagandist for capitalism, drown out the few voices of protest. Nevertheless, there are some things that can be done, some steps that can be taken toward the application of Debs’ principles to our world of today. We must recover our faith in the ability of the worker to play a leading role in our society. We tend to lose that faith every time George Meany opens his mouth. But the present situation, I assure you, is not permanent. Let us, instead, do what we can do—speak out honestly and clearly for what we stand for. Let us proclaim—and teach—our socialist faith; anywhere and everywhere, to the many or to the few. Let us stop worrying about the size of our movement and think more of its quality. Let us study, let us work hard, let us carry on the struggle to spread the gospel of socialism, so the younger generation will be equipped to understand the forces that make for the rule of gold, and those that strive for the Golden Rule. This responsibility is ours—and we can perform it best by calling the shots as we see them—without hedging, or trimming, or flinching. Let us tell the truth—the whole truth—about the world we live in. That, I repeat, was Debs’ way.